I have been using Astra Dot papers to sand my woodturned crafts and carved artwork for a number of years. After rigorous tests against other papers on the market I have come to the conclusion that this is an excellent sandpaper. It has a good lifetime, good bonding, works well with a wide variety of woods, and appears to have quite uniform particle size. The main feature of Astra Dot sandpaper is the backing which is incorporated as one piece to form a pre-determined pattern structure. This prevents loading, reduces heat generation, requires lighter sanding pressure, and gives longer sanding life. The velcro doesn’t de-bond, unlike other papers where the backing will separate from the stuck-on sandpaper with friction. This makes it a longer lasting sandpaper. 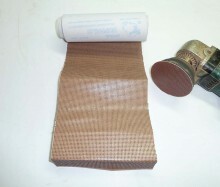 Please contact timberly@xtra.co.nz if you require multiple rolls, as postage will be quoted before sending your order. Overseas orders welcomed. Post will be quoted before sending your order. Click the button below to add the Astra Dot Velcro-Backed Sandpaper Rolls to your wish list.